In recent months, Americans have taken a hysterically fearful attitude toward Ebola, an extremely unpleasant viral disease that kills most of the people it infects in a remarkably gruesome way (vomiting, diarrhea, rash, impaired kidney and liver function, sometimes with internal and/or external bleeding). Multiple US congressmen have expressed fears that Latin American immigrants will carry Ebola into the United States from Mexico. Nevertheless, Ebola poses virtually no threat to people living in the western hemisphere, and even the threat it poses to Africans is overstated. 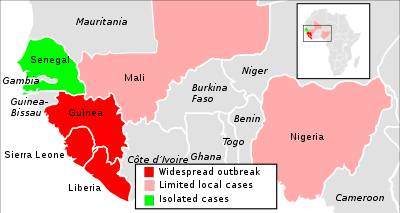 Let’s discuss the threat of Ebola in two parts–first, the threat Ebola poses to the United States, and second, the threat Ebola poses to West Africa. As you know, the United States is currently experiencing a crisis at our southern border. The influx of families and unaccompanied children at the border poses many risks, including grave public health threats. As a physician for over 30 years, I am well aware of the dangers infectious diseases pose. In fact, infectious diseases remain in the top 10 causes of death in the United States. … Reports of illegal migrants carrying deadly diseases such as swine flu, dengue fever, Ebola virus and tuberculosis are particularly concerning. He [Buschon] said, look, we need to know just from a public-health standpoint, with Ebola circulating and everything else –no, that’s my addition to it, not necessarily his–but he said we need to know the condition of these kids. Ebola has been around since the 1970’s, but never in that time has any person in the western hemisphere contracted it. Why haven’t westerners contracted Ebola? Because Ebola is spread exclusively through contact with bodily fluids. It most often reaches human populations when people handle the corpses of druikers, gorillas, and certain varieties of bats native exclusively to Africa. Person-to-person spread typically takes place during certain kinds of embalming rituals that are, once again, mostly exclusive to Africa. Ebola is not airborne. It cannot be transmitted through coughs or sneezes. Hundreds of people could get on an airplane with someone who has Ebola and be perfectly fine. Unless you have plans to touch dead African animals or dead and/or dying Ebola victims, you are not going to get Ebola. As far as lethal diseases go, Ebola is remarkably difficult to spread. On the Studebaker National Tragedy Index, most Ebola outbreaks don’t even make it to Level 3. This most recent outbreak is the first Level 4 in history, and it’s nowhere close to Level 5. This is not to minimize or demean the value of the lives lost to Ebola, only to put it in perspective. ALS, a rare disease that kills around 6,000 Americans per year (and the subject of the recent ice bucket challenge), is far more common and more lethal to Americans than Ebola is to Africans. Yet ALS pales in comparison to cancer, heart disease, diabetes, Parkinson’s, and others. But that’s comparing an African disease to western ones. Let’s compare this most recent Ebola outbreak to the number of Africans killed by other major African scourges. Malaria kills 670,000 Africans every year. Tuberculosis kills 230,000. AIDS kills 1.2 million. Compared to these leviathans, Ebola is a gold fish. Yet despite this, Ebola has attracted plenty of funding. The United Kingdom alone has pledged $10.8 million for research on Ebola. That’s $6,164 per fatality. How does that compare to the major charitable efforts to fight other African diseases? Let’s check it out. I can find data for AIDS and malaria here. Tuberculosis was harder to find, but I got the data here. Ebola is now receiving far more money per fatality than the major African killers. It is remarkable how much more bothered people are by a thousand extra fatalities they did not expect than they are by the hundreds of thousands of AIDS, malaria, and TB fatalities that are endemic in this region. This is likely a matter of media coverage. Because people in Africa are always dying of malaria, TB, and AIDS, news organizations that operate on 24-hour cycles cannot cover these diseases as if they were discrete events. When Ebola kills people, it’s an outbreak–it’s an event that happens very quickly over a short period of time. It has a start date and it has an end date. AIDS, malaria, and TB have no end. They go on in perpetuity. This is what makes them so much more deadly and horrifying than Ebola, but ironically it is also what makes the mainstream press so unable to draw attention to them. An Ebola outbreak, a terrorist attack, even a single murder may be of much less consequence than malaria in the grand scheme of things, but these things suit the television medium better. Ebola is breaking news. Malaria isn’t news, malaria is just there. Killing people. Constantly.